Among the many hidden gems in Archives & Special Collections at the Thomas J. Dodd Research Center in Storrs are these old UConn football game programs from as long ago as 1928. Among the many hidden gems in Archives & Special Collections at the Thomas J. Dodd Research Center in Storrs are these old UConn football game programs from as long ago as 1928. 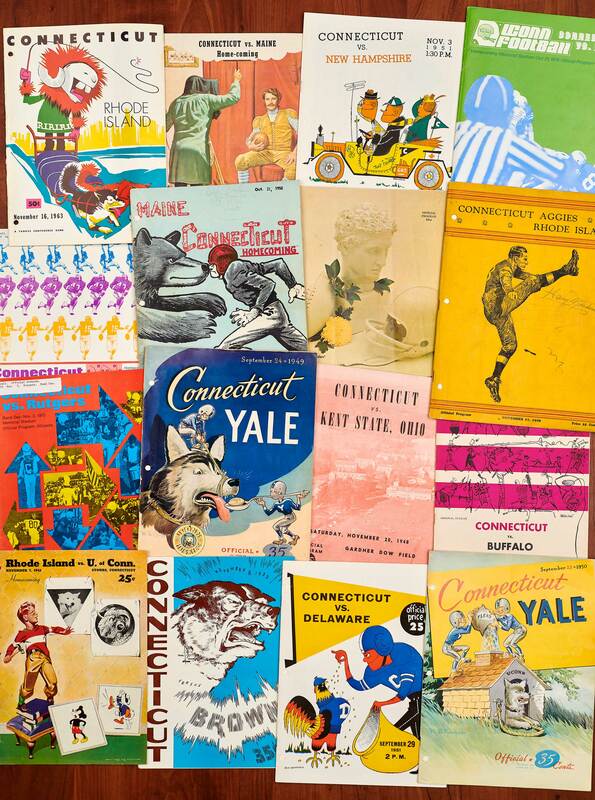 Clockwise from top left: versus Rhode Island, Nov. 16, 1963; versus Maine, Oct. 17, 1964; versus New Hampshire, Nov. 3, 1951; versus Maine, Oct. 21, 1978; versus Rhode Island, Nov. 17, 1928; versus Buffalo, Oct. 28, 1961; versus Yale, Sept. 23, 1950; versus Delaware, Sept. 29, 1951; versus Brown, Nov. 8, 1952; versus Rhode Island, Nov. 7, 1942; versus Rutgers, Nov. 3, 1973; versus Maine, Oct. 19, 1974; versus Maine, Oct. 21, 1950; versus Maine, Oct. 21, 1967; versus Kent State, Nov. 20, 1948; and versus Yale, Sept. 24, 1949.